Cut-throat shave the Bluebeards way with this super stylish replaceable blade straight razor! 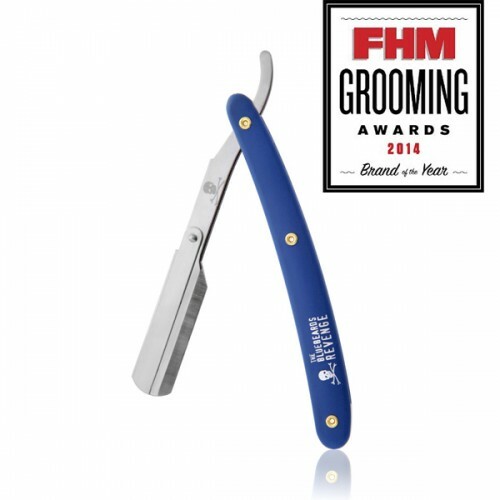 This replaceable blade straight razor uses standard double-edge razor blades which are readily available in most supermarkets as well as via our online shop. Each blade must be snapped in half prior to insertion into the holder – a quick and simple process. 1) While the blade is still in its wrapping, carefully bend lengthways until the blade snaps. Remove wrapper and place to one side. 2) Open the top hinged cover of the razor until it is pulled back completely. 3) Split the blade holder so that the razor is now fanned out into three parts. 4) Carefully take one half of the snapped blade and place in line with the location pins. 5) Carefully close the other side of the blade holder over the blade until the pins go into the holes. If the blade moves slightly at this point then push lightly back into position (but don’t use your fingers to do so as it is going to be sharp). Push the hinged cover back over the blade holder. A small portion of the edge of the blade should now be showing evenly. 6) Congratulations! You are now ready to commence the best shave of your life.